Ubuntu's marketing kick: Is Canonical the next Apple? Another six months has passed and another version of Ubuntu Linux has been released, right? Wrong. Ubuntu 11.04 ‘Natty Narwhal’ arrived today and so did a new marketing direction from its parent company and principle sponsor, Canonical. And its flavour has a hint of Apple. See the 11.04 release news here. With the arrival of Natty, Canonical has switched on a concerted effort to raise awareness that Ubuntu now offers a lot more than just a desktop operating system – it’s content and services as well. The first thing to notice about the Natty release is the “dumbing down” of Ubuntu the product. Ubuntu no longer has multiple desktop or netbook “editions”, nor the pesky “Linux” label. It’s Ubuntu the client, Ubuntu the server and Ubuntu the Cloud – plain and simple. Also with Natty comes a new website for Ubuntu, the essential ingredient of any new marketing initiative. See this blog from the Canonical design team for information on the project’s new website. The question is: With this marketing direction can Canonical dumb-down Linux enough with Ubuntu to make it appeal to the masses? Those who have observed the Linux industry for any length of time will remember Corel’s failed attempt at its own distribution. The company wanted to make Linux as easy to use as Windows on the desktop with everything point and click, instead of an unfamiliar command line. But so far, despite 20 years of history on the desktop, Linux and its distributors have failed to make anywhere near an impact on the desktop as Apple or Microsoft. Realising this gap in the Linux market remained unfulfilled, from its inception Ubuntu was designed to integrate “best of breed” open source components to make a user-friendly contender on the desktop. It certainly succeeded in making a name for its self as a user-friendly Linux alongside OpenSUSE and Fedora, but has it really succeeded in living up to its full potential? Perhaps its new direction is set to up the game. Now Ubuntu seems to be diverging quickly from its original charter of a friendly Linux desktop with the integration of Cloud services and content. All this activity raises the question of whether Canonical will be the next Apple-like software and services company – all without selling one piece of hardware. If there is one company that has successfully dumbed-down Unix it is Apple. After struggling for relevance a decade ago it released Mac OS X, a music player and the rest is history. I won’t argue some far-fetched theory that Canonical is trying to be the next Apple as they are world’s apart when it comes to software freedom, but the two companies now have quite a few things in common. Both have a Unix-like operating systems. 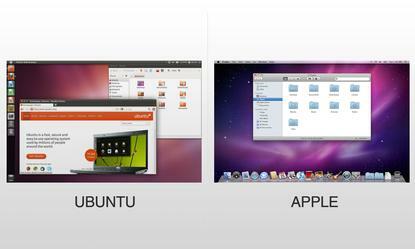 Apple has Mac OS X and iOS, Canonical has, well, Ubuntu for client PCs, not “Ubuntu Linux”. Regardless of the name they’re all built around Unix and open source foundations. Granted, Mac OS X has a lot of proprietary software in its stack and Ubuntu has always been open, but Ubuntu appears to be drifting away from its mainstream open source roots by moving to Unity on the desktop instead of GNOME. Sure, Unity is an open source project, but it’s developed and managed by Canonical for Ubuntu and doesn’t have much acceptance with other Linux distributions. In short, Unity is “Ubuntu’s desktop” and unique to Canonical. At the end of the day both Apple and Canonical leverage a truck-load of software from the open source community. Both have app stores. Is anyone apart from Apple allowed to use the term “app store” (no caps). Ubuntu has the “Software Centre” and Apple has the “App Store” (caps) on iTunes. They essentially offer a convenient way of buying and downloading software. Ubuntu has used Debian’s apt system since its inception so the Software Centre is just a nice glossy, one-click wrapper around what it has always had. Ubuntu won’t discard its free apps, but it now makes a point of offering commercial, pay-for apps as well, just like the App Store. Both have music services. Much of Apple’s success in recent years has been on the back of its iTunes music and content service, and now Ubuntu is after a piece of the action with the Ubuntu One Music Store. It’s journey to a paid-for music service hasn’t been all smooth sailing though, with many in the open source community crying foul over Canonical’s decision to use Banshee for its own music service instead of the default Amazon MP3 service. For now, the first thing you’ll see in the Ubuntu “What’s new?” video is the integrated music support. Both have Cloud services. Interestingly, the big news from Apple this week (yeah, apart from a white iPhone 4) is the company has (reportedly) purchased the icloud.com domain for $4.5 million. This directs to cloudme.com which would fit in nicely with Apple’s existing MobileMe online service. Ubuntu has the Ubuntu One Cloud service for remote storage and it works with Windows clients. So both Apple and Ubuntu are investing heavily in “personal Cloud” services. On the server Ubuntu’s Cloud offerings are more mature than Apple’s, but that could all change if Apple takes an interest in Amazon-style Cloud computing. Both have server operating systems. Ubuntu Server is the new brand for the “server edition” of Ubuntu. Apple has Mac OS X Server, which has seen limited success compared with its client offerings. OS X Server will be bundled with Mac OS X in future releases. It’s worth noting that Google is already offering a similar collection of software and services through Android. What Google doesn’t have is a footprint on the desktop the way Apple and Ubuntu do. But with Chrome OS (which Canonical has contributed to) due to arrive pre-loaded on hardware sometime this year, who knows where it will end up. So the only thing holding Ubuntu back from having as much success in the consumer software and content market as Apple is mind and market share. And Canonical’s marketing switch from Ubuntu the product to Ubuntu the ecosystem is a step towards achieving that market share. On the new Ubuntu product description page the “Ubuntu operating system” is being directly pitched as an alternative to Windows and Mac OS X. It will be interesting to see if Canonical can do what countless others have attempted and failed – bring Linux to the mainstream desktop – even if it ends up happening under an Ubuntu-only label.